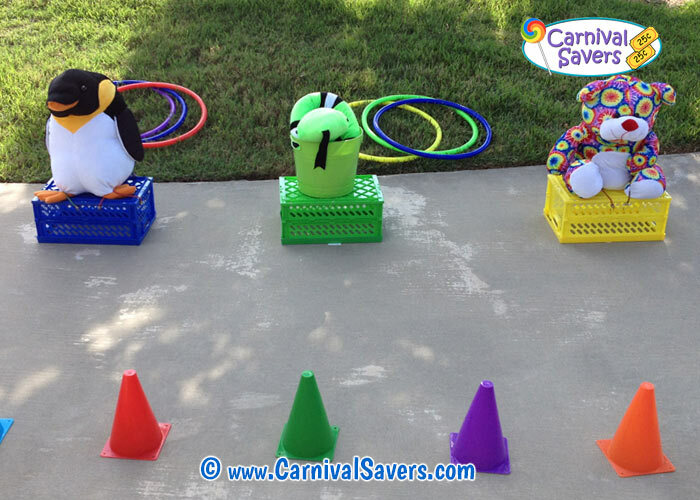 School Carnival Game Idea - Hoop a Toy! Use Bungee Cords To Keep Animals on Crates. Hula Hoops MUST be FLAT on the Ground to Count! 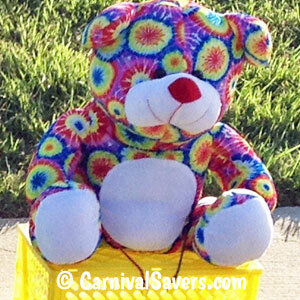 Carnival Prizes - small or medium stuffed animals are a favorite for this game and consolation prizes too! 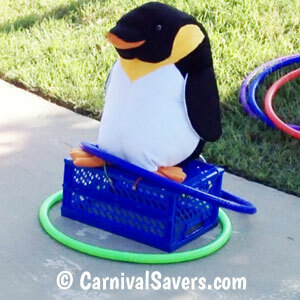 Before the carnival, secure each large stuffed animal to a plastic crate or a box using the bungee cords or with string so the animals do not fall over of off their stands during the game. Set up your "stand behind lines" as shown in the images. Note: younger children should be allowed to move up closer. Important: The size of your hula hoops really does matter! If the hoops are too large (say 5 or more inches larger than your crate or box that is holding the large stuffed animal) then this game is going to be too easy and you risk giving away your top prizes before the event is over. To remedy this, if your hoops are too large, we recommend that you have 4 stuffed animals and kids must ring all 4 stuffed animals to win a top prize! 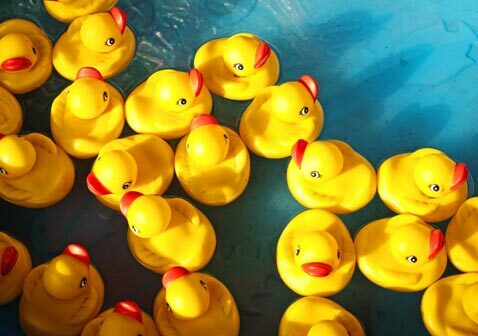 If you are using this game for teenagers or adults, place the stuffed animals and crates on a long table to make the game even more difficult! Children are given 3 hoops to try to "ring" each stuffed animal to win the top prize. If they do not "hoop" any stuffed animals, they receive a consolation prize. If they ring one or two stuffed animals, they receive a middle prize. If they ring all three stuffed animals, they get a top prize (typically a small stuffed animal). Note: As the above image with the stuffed animal penguin above...the large hoops must be flat on the ground, for the "ring" to count. This game is a fantastic game for school carnivals! It is fairly inexpensive. For example, you could look at a resale shop for the gently used large stuffed animals, as they are simply used as game supplies and not as prizes. In addition, this game looks quite impressive as it is not a dinky, small game that is almost invisible at a large carnival! The kids would stand in line time and time agin for a chance to win a mini stuffed animal by hooping one big one - so a very popular game at our event! This game is pretty challenging! Kids were so excited about winning a small stuffed animal as the top prize that they accidentally stood in-front of our stand behind lines to try to make sure to hoop each stuffed animal! So just have your volunteers remind kids to keep their toes behind the lines so the game is fair! SO FUN for the HOOP A TOY SCHOOL CARNIVAL GAME!